Have you ever wondered what camera or Photography gear you should buy? 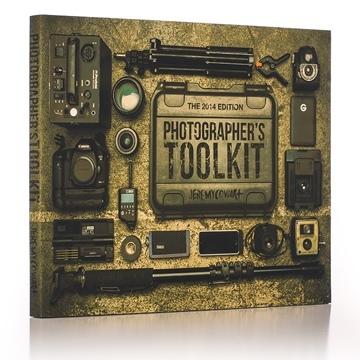 Look no further than Celebrity Photographer Jeremy Cowart's new book "Photographer's Toolkit". He goes through and showcases all the real-world gear he uses on shoots and explains why. From free to not-so-cheap, there's something in here for photographers of all backgrounds. Jeremy Cowart is a celebrity photographer shooting names such as Sting, Heidi Klum, Kelly Clarkson, Britney Spears, Gwyneth Paltrow, Luke Bryan, The Civil Wars, The Kardashians, Brad Paisley, Ryan Seacrest, Carrie Underwood, and Taylor Swift to name a few. With three photography books already published, Jeremy's latest, “What’s Your Mark?”, hit stores nationwide in Spring 2013 and features friends and celebrities that have made a mark on the world. Though photography is his passion, teaching and speaking have become a huge part of Jeremy’s career as well. In addition to creating his LifeFinder DVD and speaking at TEDx Nashville, he teaches at all the major photography conferences such as Photo Plus Expo, Photoshop World, WPPI, ImagingUSA, Palm Springs Photo Festival and more. He also is a Kelby Training Instructor and has taught on the creativeLIVE platform as well. Recently named “Humanitarian of the Year” by WPPI, Jeremy is passionate about investing in personal projects that work toward the good of others. His “Voices of Haiti” and “Voices of Reconciliation” series in Rwanda were both featured on CNN, highlighting the power of hope and healing through photography. In addition, Jeremy is the founder of Help-Portrait, a global movement of photographers giving free portraits to those in need. Five years into the movement, Help-Portrait photographers and volunteers have provided nearly 300,000 portraits to people in need in over 65 countries and every American state. Social Media has played an important role in Jeremy's career. With over 1.5 million followers across the various social networks, Jeremy recently founded a new social network/community called OKDOTHIS. 2.0 just launched in June of 2014 and has already been featured or mentioned by Fast Company, TechCrunch, MacWorld, Mashable and many other tech outlets. OKDOTHIS is now available for free in the iTunes App Store.